live readings from the author plus original and new books available. "Mission accomplished" famously announced a banner behind George W. Bush in 2003 on the deck of a US aircraft carrier just off the California coast, safely thousands of miles away from the (puzzlingly ongoing) hostilities in Iraq. The 'second gulf war' is just one of the historical events captured in a series of books known as 10 x (10 + -10) = 0 by Doc Drumheller. Devised as a kind of twisting DNA double helix of line restrictions and rhyme schemes spread over 10 books, each with a palindrome at its heart (where the strands intersect) the series captures many events and significant developments like a time capsule in a mesmerising, almost psychedelic form. The central books (The Grey Area and The Missing Links) are themselves entirely made up of palindromic verse. Drumheller begun this self-set mission of (more than) a decade in 2002, the year the human genome was finally mapped, no small inspiration for the structure of 10 x (10 + -10) = 0. The first book of the sequence is entitled Blueprint for Ressurection or Destruction and the concluding chapter written some 10 years later is The Architecture of Apocalypse. The first two chapbooks were accompanied by acclaimed multimedia performances bearing their name (Blueprint... and Fears and Fetishes) which made appearances in the Dunedin and Wellington Fringe Festivals and the NZ International Poetry Festival (Wellington). They featured a unique blend of live and video-captured poetry, puppetry, perversion, curated soundscapes, pre-recorded and live video, found footage and costume. The original chapbooks of the sequence are now rare collectors items with few of the original, limited print runs left. They came accompanied with instructions on how to cut up and paste them together into long double helixes of poetry so there is no way of knowing how many books still exist in their original form. Now the sequence is complete it is finally available in one collection: 10 x (10 + -10) = 0. An impressive tome collecting all 200 poems from the sequence presented in their original shape and colours (each chapbook was entirely monochromatic, coloured according to the CYMK process with the central books presented in grey) plus extensive notes and introduction from the author, an index of phonemes used in the composition of the poems plus a never before published early poem, 'Inside Out', a precursor to the curious obsession of the series. 10 x (10 + -10) = 0 is the most ambitious publication to date from Republic of Oma Rāpeti Press. A piece of New Zealand literary history, an anomaly, a time machine, a mathematical function, a shamanistic science experiment from a 'neo-music/poetry visionary'. 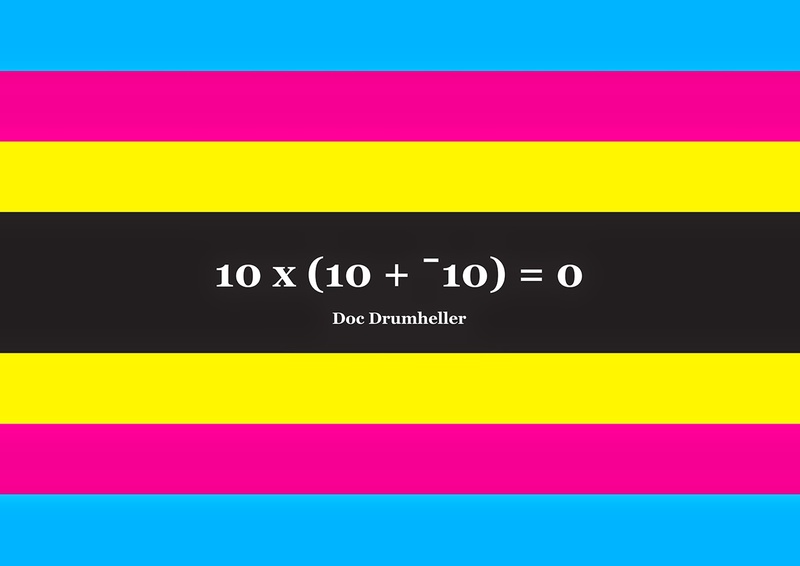 10 x (10 + ˉ10) = 0 is a ten year project by Doc Drumheller. There are ten books (1 per year) published in this series. There are twenty poems in each book, inspired by the most significant events of that particular year. “In 1999, a group of my friends leased a 1920’s maternity hospital where we experimented with music, film, theatre, performance art, photography, painting, sculpture, poetry, prose, sound engineering, gardening, spirituality, and rock ‘n’ roll,” Doc says. The poems were written using restriction writing techniques e.g. : restricted by the amount of syllables or words per line, parts 10 & ˉ10 in each book are palindromes, which means they read the same backwards as forwards. “I was inspired by the work of 20th century art movements like Futurism, Dada, Surrealism, the Beat Generation, Absurdist Theatre, and the Oulipo,” says Drumheller. 10 x (10 + ˉ10) = 0 began after the mapping of the human genome in 2002. This year was also significant as 20/02/2002 was the first perfect palindrome date in one thousand years. “My first vocational aspiration was to become a medical researcher and my nights reading Gray’s Anatomy are reflected in the early work. I performed surgery on my ventriloquist dummy and pulled strings of sausages and poems from his insides at festivals around New Zealand,” Doc says. Each book is designed to be cut up and reassembled and the poetry creates shapes inspired by DNA strands and explores phonemes like a mathematic symphony. “My aim was to create a time capsule of a decade and if there is any conclusion I could draw from this experience is that humanity has become too passive, the opposite side of this equation, is to become more active and engaged in the world around us,” suggests Drumheller. This project compiles all ten books, presenting all 200 poems into one collection for the first time. A project of experimental and innovative poetry on this scale has never been produced in New Zealand. “By completing this project, which I set as an almost impossible task, I have proven to myself that everything is possible, and hope that it may inspire other artists to challenge themselves to go for the limit,” says Doc. Doc will perform poems from the project at the launch, and individual chapbooks from the series will be available for sale, as well as the 232 page epic:10 x (10 + ˉ10) = 0, collecting all ten books. 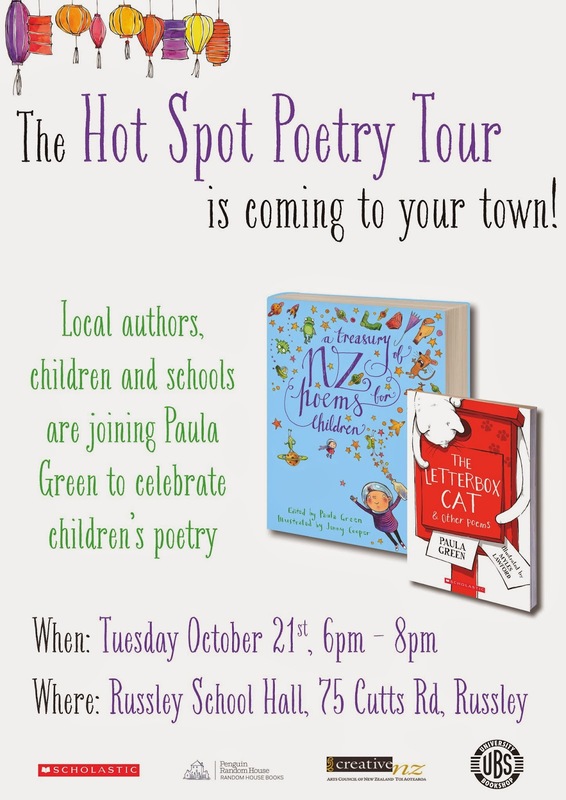 Paula Green, writer and editor of A Treasury of NZ Poems for Children is heading off round the country to promote the book and bringing along a rag-tag bunch of poets with her. 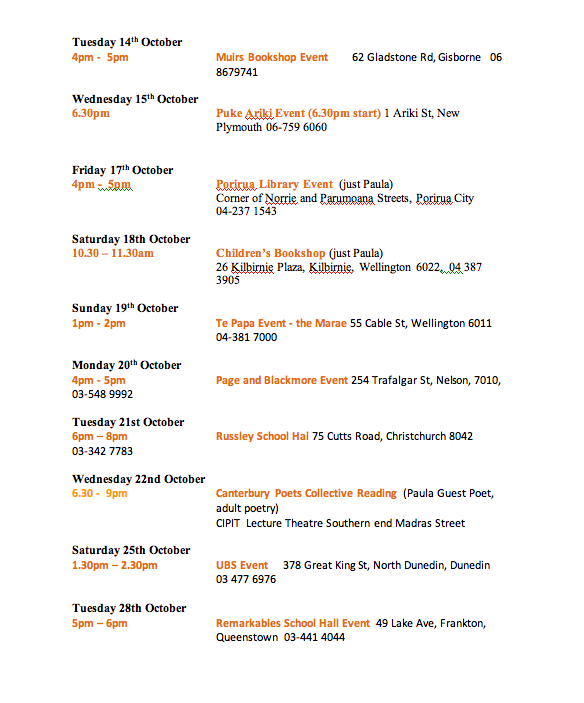 Calling all Christchurch Poets - be part of live poetry readings in a poetry installation by Poetica - the Christchurch Urban Poetry Project. Poetica's ‘Emerge’ installation involves a line of poetry by W.B. Yeats floating in the Avon River. Accompanying the installation are readings and artist-led, 'liquid poetry' sessions where people can write poetic messages with water. 'Emerge' is part of FESTA - The NZ Festival of Transitional Architecture - one of the most exciting, diverse and internationally significant events in the country now into its third year. Anyone is welcome - just get in touch as soon as possible via private message to Poetica on Facebook or email kirstyhdunn@gmail.com with your details and your preferred slot for reading (see above).